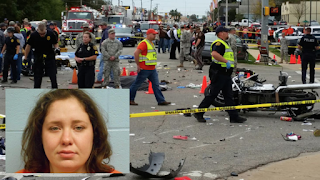 Lawn chairs, blankets and water bottles were strewn in the street and bodies remained at the scene as Oklahoma State University fans walked past an intersection where a woman had plowed her car into a homecoming parade crowd hours earlier and killed four people. Some lingered Saturday to look at the aftermath that also included a gray car with a smashed side and shattered windshield, and a crumpled motorcycle. Dozens more were injured in the collision that sent some spectators flying through the air. The driver is suspected of being under the influence, and investigators were awaiting results of blood tests to determine if she was impaired by drugs or alcohol. "You look at the carnage alone. (Someone) had a little baby stroller crushed up. It's disgusting," said Dan Whitmire, who was visiting his daughter from Dallas and had planned to attend Saturday's homecoming game, which was held anyway, but changed his mind after the crash. Three adults died at the scene and a 2-year-old boy died later, Stillwater police Capt. Kyle Gibbs said. He said 44 people were injured. Officials with Oklahoma University Medical Center and The Children's Hospital in Oklahoma City said the 2-year-old was one of eight patients brought there, and that four children and three adults remained hospitalized with conditions ranging from good to critical. Adacia Chambers, a 25-year-old Stillwater resident, was arrested on the DUI charge after the morning crash and remained jailed Saturday night. Gibbs said Chambers' Hyundai Elantra struck an unoccupied motorcycle of an officer who was working security at the parade, then went into the crowd. "I just saw smoke and saw the panic in people's faces as they ran away from the scene," said Geoff Haxton, of Tulsa, who attended the parade with his children. This photo provided by the Stillwater Police Department on Saturday, Oct. 24, 2015 shows Adacia Chambers. Police said Chambers plowed her car into a crowd of spectators Saturday during the Oklahoma State University homecoming parade. "People were flying 30 feet into the air like rag dolls," Walker said. Gibbs said it could take several days to get more information about the cause of the accident. "We treat these like we would any homicide investigation," he said. 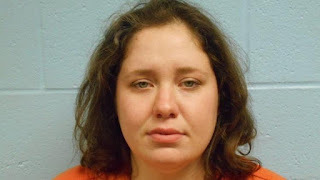 Chambers' father, Floyd Chambers of Oologah, told The Oklahoman newspaper he couldn't believe his daughter was involved and said she was not an alcoholic. He described her as "timid" and said she had attended homecoming festivities Friday night with family but that her boyfriend had told him she was home by 10 p.m.
"This is just not who she is. They're going to paint her into a horrible person but this is not (her)," Floyd Chambers told the paper. 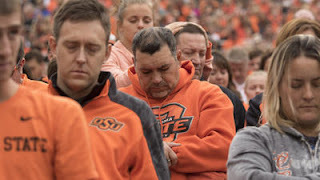 Oklahoma State University President Burns Hargis said there had been discussion about canceling the homecoming game against Kansas, but it was played as scheduled. The victims were remembered with a moment of silence before kickoff, and most of the OSU players knelt on the sideline in prayer. Hundreds of fans wearing the school's bright orange and black colors had to walk by the intersection, less than three blocks from the stadium, as they headed to the afternoon game. National Guard troops kept watch as officials with the Red Cross and state medical examiner's office continued their work. By Saturday evening, the bodies that had been at the scene encircled by orange cones for most of the day had been carried away. The car and motorcycle had been loaded onto tow trucks. Clothes, water bottles and pieces of the car had been hauled away in large plastic bags. It's not the first tragedy to strike events connected to Oklahoma State sports programs. Ten people, including two OSU men's basketball players, were killed in a 2001 plane crash while returning from a game in Colorado. And Oklahoma State women's basketball coach Kurt Budke and assistant Miranda Serna were among four killed in a plane crash in Arkansas in 2011 while on a recruiting trip. "The families, I know, and these victims will never be able to understand this, nor will we," Hargis said.